None of us are “out.” To a one, we all have secrets, aspects of ourselves we might like to share but which, for our own reasons, we do not. There are blog posts I won’t write because their very premise would say too much about me. “Atheist” is far from the most marginalized category to which I belong. Yet “out” I am, as an atheist at least. I told the story of how I came from my Catholic upbringing to my current aggressive antitheism in three installments, but it doesn’t spend much time on how my friends and family came to understand it, or not. I had no concept of atheism as such when I came to the realization that deities were imaginary. I was a precocious fourth-grader, and I was too excited at the prospect of having solved a big tricky puzzle to even contemplate the perks of not having to go to Sunday school anymore. My brother faced my epiphany with confusion, offering no hint that he understood it; he may not even remember the conversation. The friend I shared it with shouted at me as a blasphemer, a reaction I found at least as incomprehensible. And my parents? They were no different, and I can’t blame them. I hadn’t finished forming those thoughts before their magnitude compelled me to air them, and they weren’t impressed, nor were they permissive. They tried to convince me I was wrong, but they didn’t know what they were arguing against, and I couldn’t have told them yet. The lesson I learned was altogether different: keep it a secret. They didn’t change my opinion even a little, but they taught me that all-important lesson of being an American atheist in an immigrant family: keep secrets. I had found and peeked out the closet door, and shut it firmly. If it were only the different worldview, it might be easier to be a Hispanic-American atheist in the United States. The US was born secular, and that spirit of permissiveness has made sure that no individual faith can claim a majority. Roman Catholicism is the single largest denomination, and they and the agglomerated flavors of Protestantism together claim most of the United States’s people, but no faith can call itself the faith of Americans. No faith is a given of American-ness the way Romanian Orthodoxy is for now built into the Romanian condition, or Twelver Shia Islam into the Iranian. It is only by eliding the differences between Christian sects and pretending that fundamentalist Protestant home-churches have more in common with liberal Catholic non-church-goers than they do with Twelver Shia Islam that the people of the United States become a “Christian people,” and Americans who profess to some other faith, or none, become something Other. If it were only refusal to partake of the rituals, it might be easier as well. There is more to Hispanic-ness than the Catholicism that characterizes most of us. Someone who doesn’t attend the local church’s Christmas show or baptize their children is still more odd than threatening, if they make the right apologies. But there’s an elephant in the room that turns a Hispanic-American’s “I don’t believe” from mere blasphemy and cultural denial and rebellious affectation into a writ of enmity against kith and kin, no more and no less than treason. A big, red elephant emblazoned with a hammer and sickle. Every Hispanic person in the English-speaking world gets this question. One and all, we must all eventually confront…Speedy Gonzales. Speedy Gonzales, the fleet-footed cartoon mouse with an outrageous Mexican accent and ethnic costume who spends his time outsmarting and outrunning various cartoon gringos and peninsulares in the service of his large family. Speedy Gonzales, that bit of Latin America amidst the classic Americana of Loony Tunes that brought at least a little of Mexico’s rich culture to American attention, however flawed. Speedy Gonzales, who predates the rest of the classic still-relevant Hispanic cartoon characters on Anglophone media by decades and was, for eons, our only representation in the medium. Speedy Gonzales, who made sure that every single frigging time someone learns my last name, I hear catch phrases. Thanks to that fifty-year-old cartoon mouse, being a GonzaleZ in the English-speaking world means hearing way too many “¡Ándale arriba!”s thrown your way and no one ever spelling your surname correctly even though it’s the original Spanish spelling minus the Anglo-confusing accent mark. I kind of resent the little guy for that, if nothing else. But the rest of my feelings about the Speedy aren’t quite that simple. Cartoon Network ceased broadcasting Speedy Gonzales in 1999, citing concerns that the segments were racist. After all, that accent is so heroically overwrought that Chris Tucker couldn’t do an impression of it. Speedy’s costume is arguably not even Mexican (that’s a San Fermín festival kerchief, from Spain), making his Mexican-ness clueless as well as ham-fisted. The majority of the other Mexican characters aren’t any better, either. Where some are fairly well-done depictions not at all out of place in Revolution-era Mexico, the rest are all always wearing the same filthy outfit complete with a sombrero no matter what time of day it is. And they spend almost all of their time smoking, getting drunk from clay bottles, and dancing to Mexican music. Speedy’s brother Slow Rodriguez shoots someone in the face for antagonizing him. This nonsense comes from higher up in the same well of racism that gave us Bugs Bunny’s blackface hunter, and needs to be acknowledged if we are to be critical consumers of popular culture. But the thing is, Speedy is the hero. He spends all of his time tricking equally outrageous caricatures of white Americans and wealthy Mexican landowners into dynamiting themselves, and he does it all for the love of his friends and family. He’s determined, snarky, inventive, and virtually fearless. And he almost always wins. Is it any wonder that Mexicans in particular are awash with affection for Speedy Gonzales, who gives Americans who think they’re all lazy poncho-clad alcoholics and bandits their comeuppance? 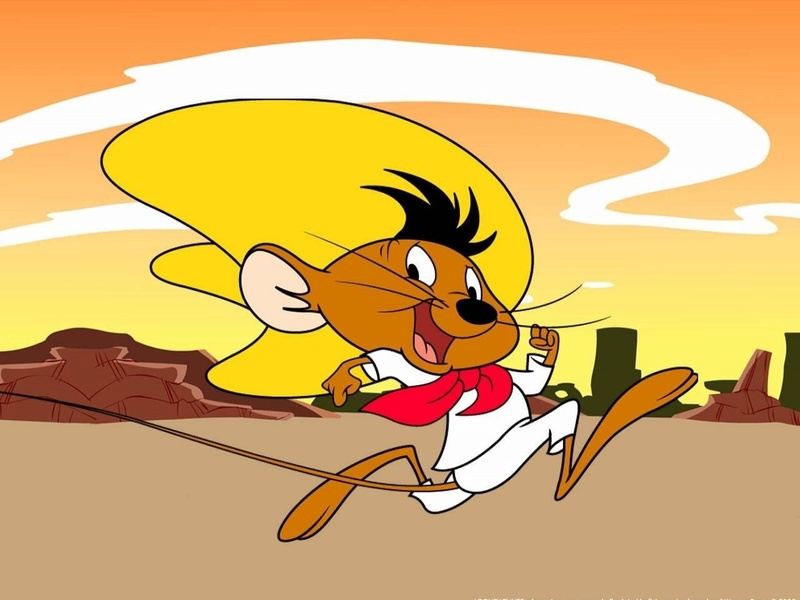 Is it a surprise that Speedy Gonzales has become a cartoon role model, held as a dependable and capable heroic ideal by thousands of Latino families? He even sings Cielito lindo correctly. Not a garbled mishmash of Spanish-sounding syllables designed to sound familiar to Anglophone ears—he sings the actual words, in all their cloying sweetness. If anything, Speedy Gonzales is a potent, almost tragically unsubtle commentary about class relations in Latin America. It’s an even more powerful escapist fantasy of a scrappy Latino showing some overly entitled gringos what’s what. And when you’re from a lineage that still gets on Anglophone TV primarily when the writer needs a drug runner or an abusive husband or a cuckold or a dark-haired beauty to bring sympathy to a street gang, it doesn’t matter that Speedy Gonzales is from elsewhere in Latin America, at home in a desert you’ve never seen, singing Cielito lindo instead of Guantanamera—you hang on to that.